Interested in learning more about the infamous John Deere 318? Start here. Searching for references such as John Deere 318 Owner’s Manuals? Click here. 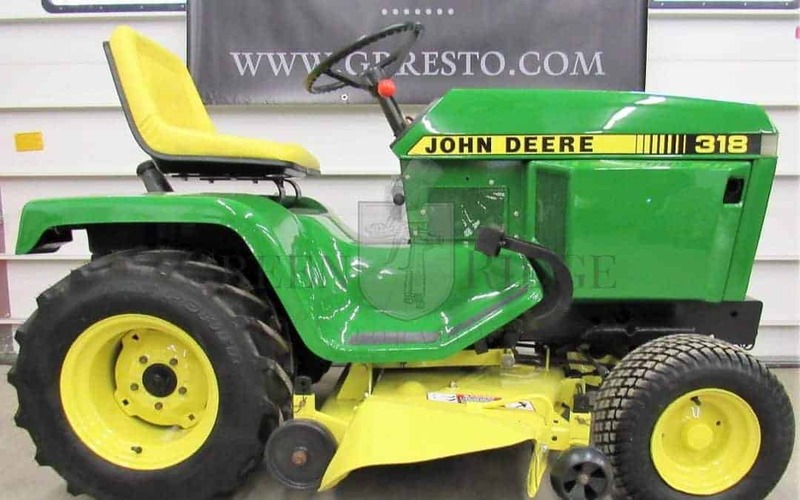 Want to compare vintage John Deere lawn and garden tractors? Here you go! 1. My 1989 John Deere 318 runs great, but it stalls after mowing for about a 1/2 hour and won’t restart until it cools off. A: 1987 and newer 318’s use a Onan p218g engine with electronic ignition. Normally, that problem is caused by the ignition module that is located behind the flywheel. 2. The engine on my John Deere 318 is surging and will only run smooth if I pull the choke. A:There are a few things that will cause this issue. The most common is a dirty carburetor – normally dissembling and cleaning the carburetor will cure this. Another cause for this is that air is being drawn in someplace, such as a split intake manifold. The Onan engines in the John Deere 318’s used a 2-piece manifold that can separate. 3. When my 318 gets hot, the mower deck will not engage. A: Sounds like your PTO clutch is out of adjustment – the proper gap setting is .018. It is is set by tightening the 3 spring loaded nuts around the clutch. For a quick fix, you can tighten each nut equally about a 1/8 of a turn and see if that is enough to get it to engage. 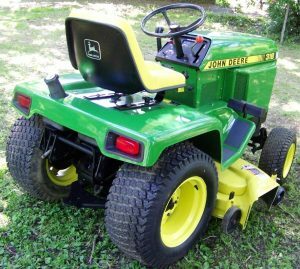 This also applies to other John Deere lawn and garden tractor models, including the 316, 318, 322, 330, 332 and 430. 4. The starter on my 1990 318 doesn’t always engage. Sometimes I have to turn the key 3 or 4 times to get it to turn over. I already changed the starter but it still has the same problem. A: The way 1986 and newer John Deere 316, 318 and 420’s were wired from the factory did not provide a full 12 volts to the solenoid when you turn the key. Many times, people will replace the starter thinking that is the problem. The real cure for this problem is to add a relay to provide a full 12 volts to your starter. John Deere offers what they call a starting improvement relay kit – part number AM107421. This includes the relay and wiring harness needed. 5. My Deere 318 won’t start. I have spark, but no fuel. I’ve already replaced the fuel pump, but still no fuel. What would cause this? A: Many times this is caused by bad fuel lines – even if they look ok from the outside, they deteriorate on the inside. The main reason this happens is because today’s gasoline contains 10% or more ethanol. I recommend using non-ethanol fuel or treat your fuel with a product such as Startron. If you enjoy tinkering with your John Deere – or you’re trying to troubleshoot a problem you’ve been having – I recommend getting a copy of a John Deere User’s Manual to reference. Try searching online if you don’t have one already. 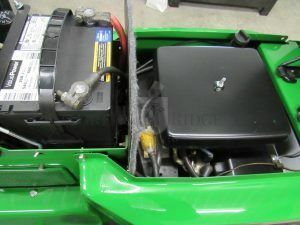 For instance, this comprehensive manual for the John Deere 318 also covers the 316 and 420 as well – it’s available here, at MANUALSDIR.com. What about you? Did you ever encounter a tricky problem with your JD 318? How did you figure it out? Let us know and we may feature it in an upcoming blog post! 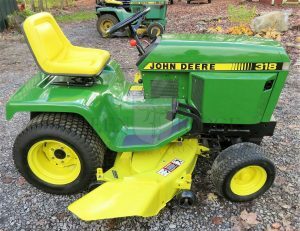 ✪Looking for a John Deere 318 for sale? Click here to see our latest offering. 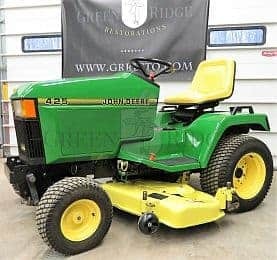 If you ask a group of John Deere enthusiasts what their favorite lawn and garden tractor model is, the 318 is likely to rank at the top of the list. Manufactured from 1983-1992, this perennial favorite has become a bonafide American classic. 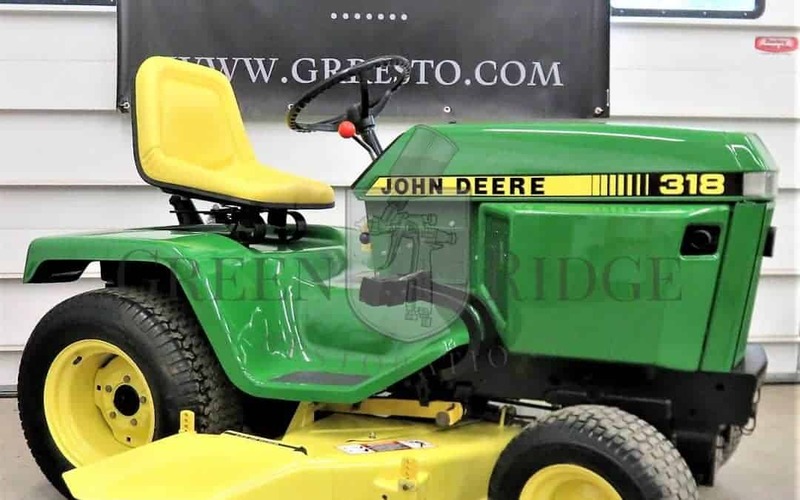 At Green Ridge Restorations, the #1 model we buy, sell and restore is the John Deere 318. It’s not uncommon for us to purchase an old 318 from the original owner – still in excellent condition and well-cared for – even after all these years. These powerhouses reigned supreme throughout the 1980s into the early 1990s, and continue to be found in service throughout the US – a quarter century after the last one rolled off the assembly line in Horicon, WI. During the years 1983 through 1987, John Deere used an 18HP Onan B43G 2-cylinder, air-cooled gas engine. From 1987 on, the B43G was replaced by Onan’s P218 18HP 2-cylinder, air cooled gas engine. The 318 also featured a shaft-driven hydrostatic Sundstrand 90 transmission. Mower deck sizes were 38”, 46”, and 50”. Several bagger systems, ranging from a standard two-bag, 6.5 bushel to an impressively large, 13-bushel collection system. 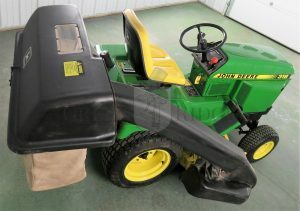 Our restored John Deere 318’s with Power Flow baggers systems are some of the most popular models we sell. When Was My John Deere 318 Made? If you want to determine what year your 318 was manufactured, start by retrieving the serial number, which is located on a small plate beneath the steering column. Basically, John Deere 318 serial numbers begin with “M00318X”. Following that, you’ll see a group of six digits, such as 285073. A whole serial number stamped on the plate will therefore look something like this: M00318X285073. Those last six digits identify the manufacturing year. 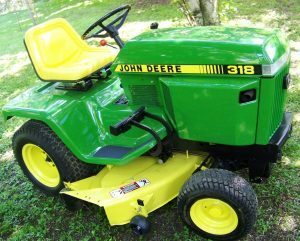 The John Deere 316 is a lower-end model that is similar to the 318, but without power steering. 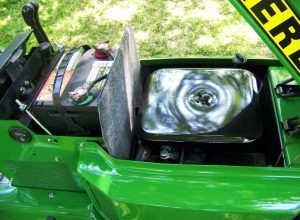 If you’re used to power steering on your lawn and garden tractor, operating the 316 can definitely feel awkward at first. Additionally, some lesser known models also produced during that time included the Yanmar-powered 322, 330, and 332 Deere models. Fun fact: John Deere was riding high in the 80s. In May 1984, its Horicon Works plant in WI produced its 1 millionth lawn tractor there, a 318. Not unlike our own experiences selling restored vintage models today, the 318 was a top seller during its production years. 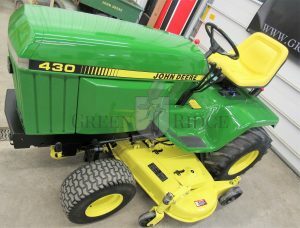 If you need parts for your own 318, John Deere still offers many for sale. For engine parts, Onan Parts is a great source. You can also check to see if a farm and garden store in your area has access to the parts you need. 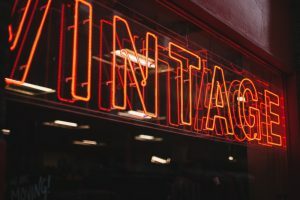 If you’re looking for an obscure part or trying to get a deal, you can always check out eBay since the inventory and offerings are constantly changing. Need a manual for your 318? Search Google to see what you find – sometimes whole manuals are available for free in PDF form or directly online. Or, try one of the resources already listed above. 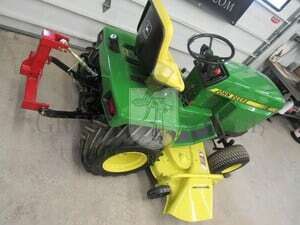 If you want more detail on the John Deere 318 or any other model, we highly recommend TractorData.com and the Weekend Freedom Machines Forum. Like any classic piece of American history, the John Deere 318 has a devoted, almost cult-like following. For many, the memories of a beloved family member painstakingly manicuring the lawn with his 318 are even more valuable than the tractor itself. Movie theaters enjoyed a resurgence of popularity. Return of the Jedi and Scarface were box office hits. And of course – who could forget Flashdance? And “new” food items became household munchies, like the introduction of flavored popcorn, wine coolers, fruit roll ups and Steak-umms. And how about cars? Remember what Motor Trend’s Top Car for 1983 was? The AMC/Renault Alliance! Motor Trend admitted it was “certainly no lightning bolt” and its boxy shape looks awkward and out of place compared to today’s smoothly contoured cars. At Green Ridge Restorations, we’re helping the next generation of John Deere enthusiasts create new memories with the classic 318. 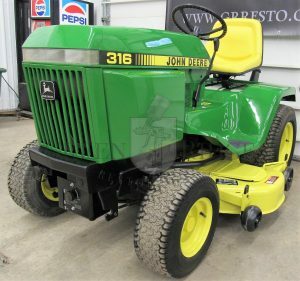 We often have a John Deere 318 for sale, but they don’t last long. Click here to see if we have any currently available.